Last Sunday we spent the day in Hastings being tourists! 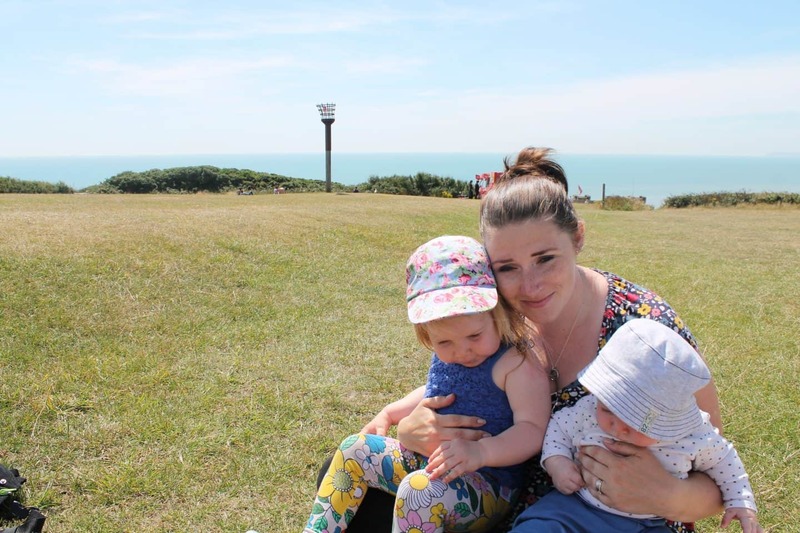 We hadn’t had a family day out a while and Hastings is about an hour drive from us, long enough to not go very often but not so far that the journey is unbearable with two children! Hastings is a seaside town in East Sussex and is the heart of 1066 Country, close to the site of the Battle of 1066. Is it just me who gets weirded out with just how long ago that was? I try and imagine what life was like around that time and I just can’t! 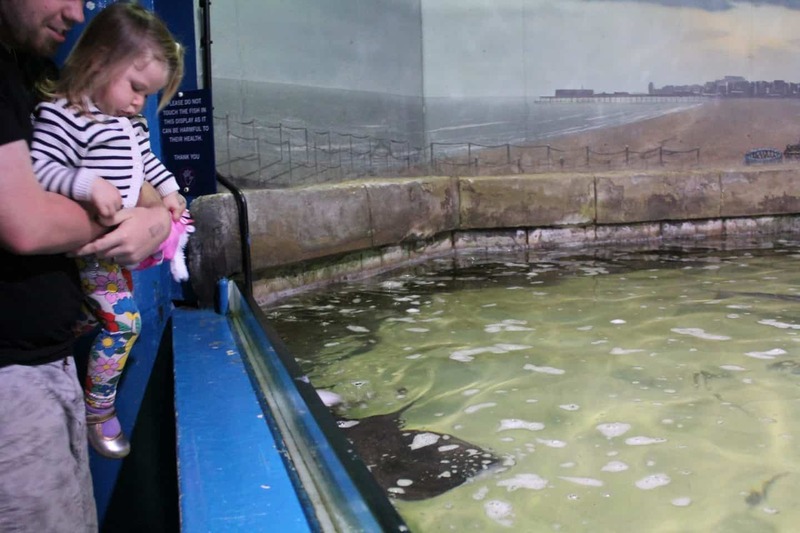 Her favourite part was watching all the different sea creatures swimming around in the larger tank, both looking in from outside and then looking up from inside the tunnel with the fish (and sharks!) all around! We were there for feeding time too which meant the fish all came right up to the viewing window so we could get a closer look! 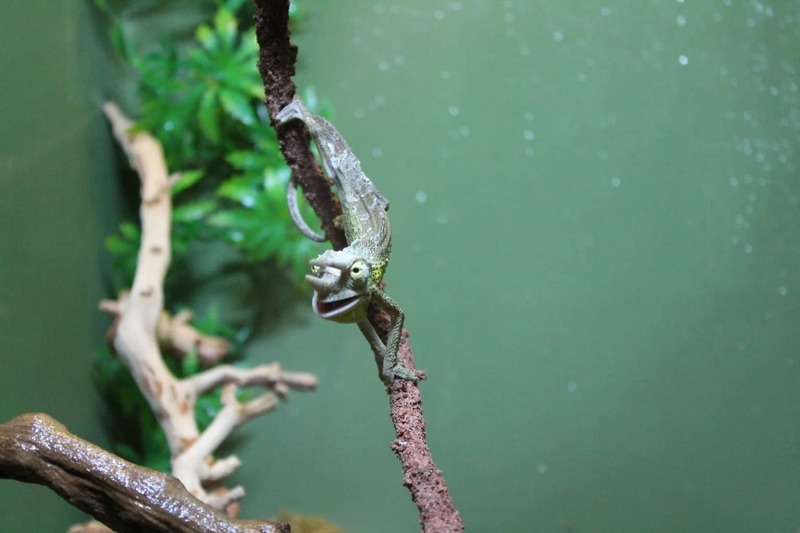 As well as the underwater dwellers there was a room with reptiles in too, and this dude was called Samuel, and is a ‘Jacksons Chameleon’. His face was hilarious, and he reminded us of a creature from an animated film! There were also turtles, Iguanas, Snakes and lots more too! 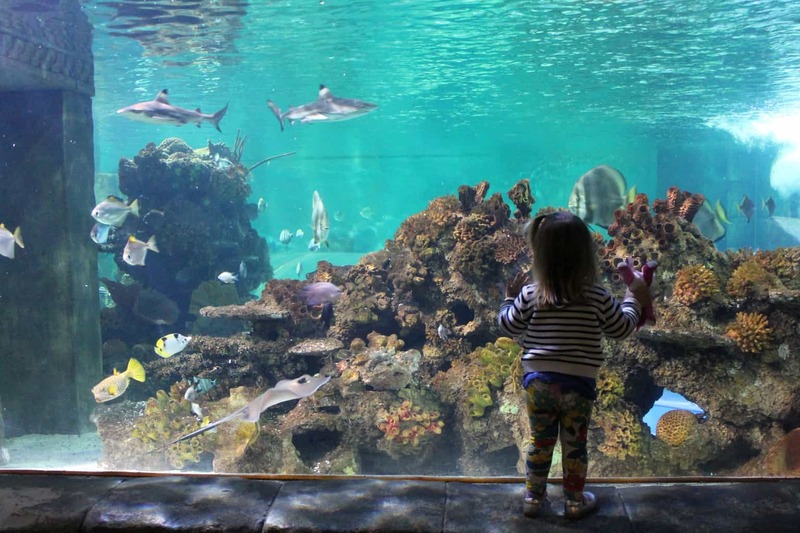 Everything was spaced out with plenty of room to see the fish and animals with lots of information about each species and their original habitat. 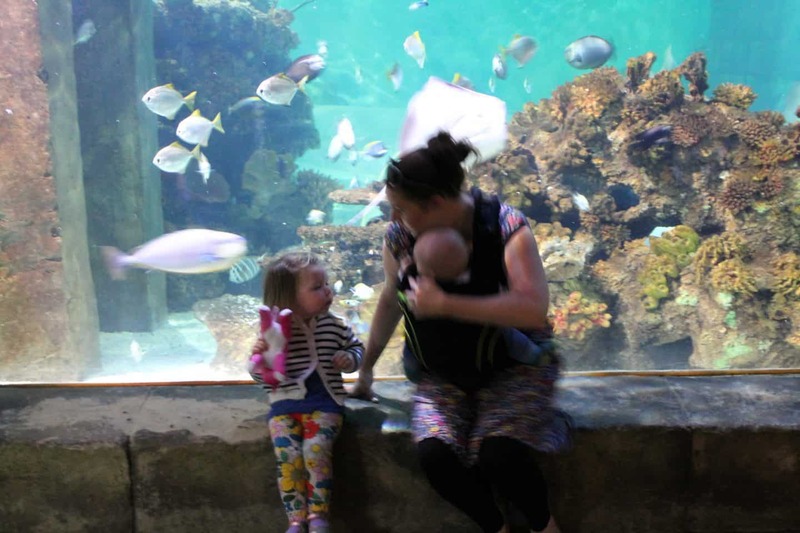 The entrance ticket for Blue Reef gives you the freedom to come and go for the day, so you could always come back in for the afternoon feeding sessions or meet a reptile talks. We thought Athena was probably a bit young for that though so we’ll save it for a few years down the line! We walked along the seafront next to the miniature railway line towards town, passing a stage being set up for the ‘Nearly on the Beach’ concert as part of Hastings Old Town Carnival Week, and a little later on we also saw the start of the procession for the coronation of the carnival queen! I had instagrammed a snap of Hastings and some lovely person had recommended going to the Pelican Diner for lunch, and I am so pleased I took her advice! It was absolutely hands down the best milkshake ever, so thick it got stuck in the straw, plus chai flavour!! I’m drooling remembering it… The actual food was pretty insane too, waffles or pancakes smothered in syrup and cream with heaps of stewed apple! Sam had a proper burger and fries with a root beer float! We were also lucky enough to bag a coveted outside table so we could watch the world go by on the seafront! 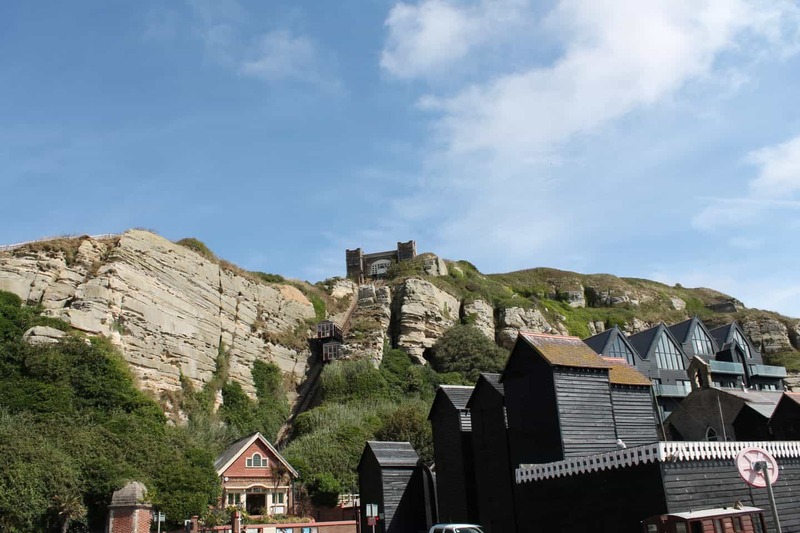 After a stroll around the Old Town we found the West Hill lift which takes you up to Hastings Castle, which is now in ruins but was the first castle built by William the Conqueror! 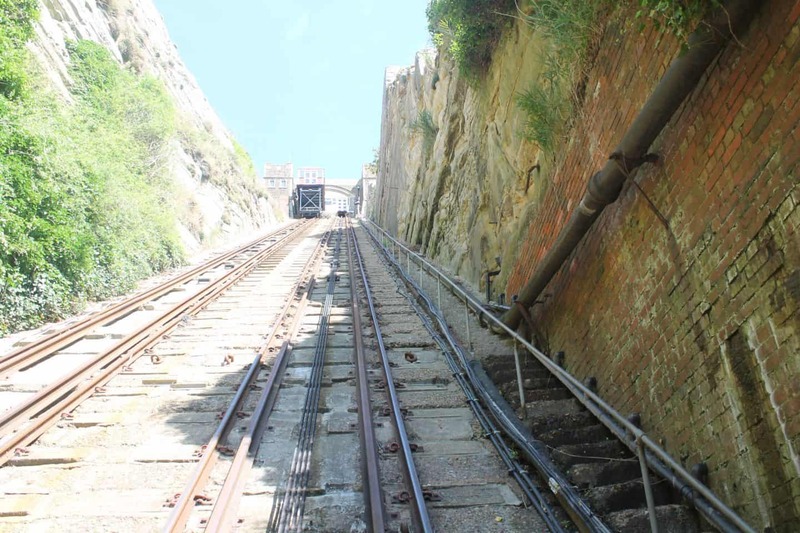 We decided not to go up that Funicular Railway (a cliff railway, dontcha know!) as Athena was looking like she might fall asleep in the buggy and the size of the lift cars meant buggies had to be folded. Instead we walked to the seafront to see if we could find a quiet spot for a rest but then someone spotted all the small-person sized fairground rides on the beach and woke right up again! 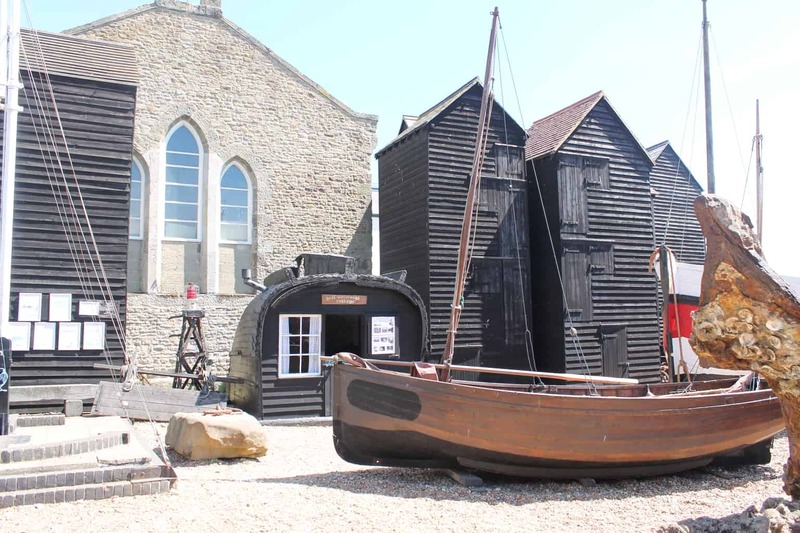 We popped into the Hastings Fisherman’s Museum to find out more about all the Net Huts outside, which are two and three storey buildings for the fisherman to hang and sort their nets in, in a nutshell! There was a video display along with all sorts of artifacts and displays to explore as well as a proper boat! We dropped the buggy back at the car and went to the East Hill Railway which is the steepest funicular railway in the UK! 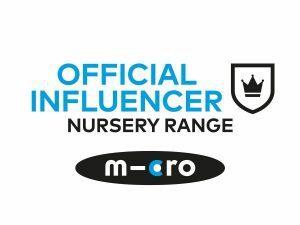 The cars for this one are actually bigger and we could have used the buggy but as it leads up to a lovely nature reserve we didn’t want to be hampered by wheels so took the baby carriers instead! The lift-carts travel sedately up and down and have benches in them, and the views as you go up and down are amazing, the seafront and town rushing away from you as you glide upwards! Athena was pointing out the fishermans boats as we went up, and you could see the (sadly recently burnt) pier in the distance! 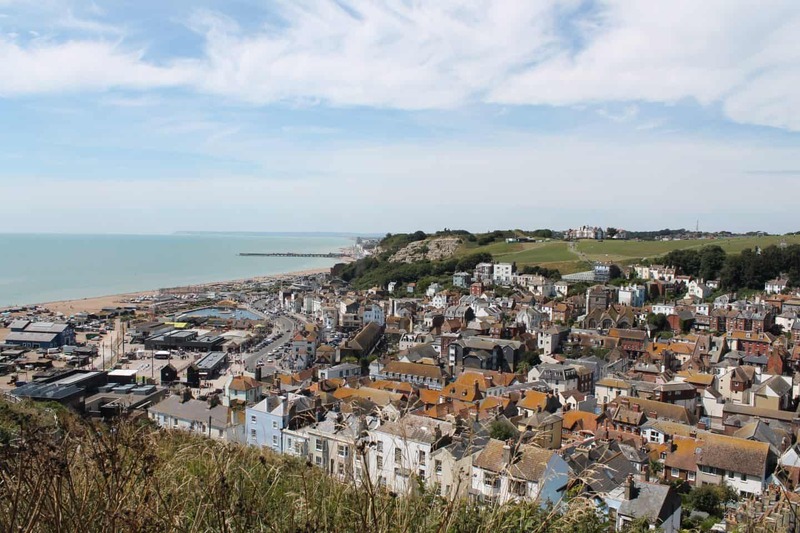 Once we arrived at the top we suddenly found ourselves in Hastings Country Park, and could see over the Old town towards the ruined Hastings Castle on the opposite cliff! The pier is being renovated and is due to re open in spring 2016, along with a complete rejuvenation of that part of the seafront and the addition of a world class skate park too! We spent a lovely couple of hours walking around, exploring the countryside. 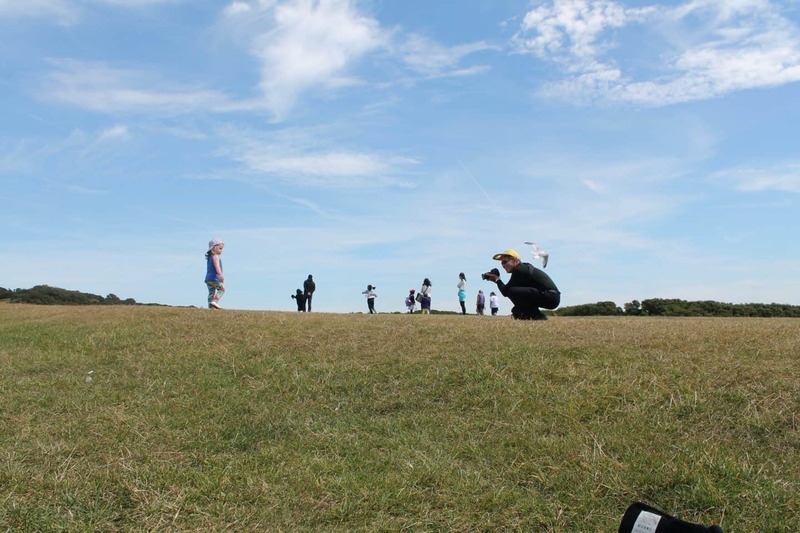 We found some ladybirds in the grass and Athena spent quite a lot of time shouting at Seagulls and chasing them away, much to the annoyance of a Japanese tourist who was trying to take their photo! You can see in my picture above that it actually looks like he’s papping Athena rather than the Seagull that just flew over his head because she chased it! 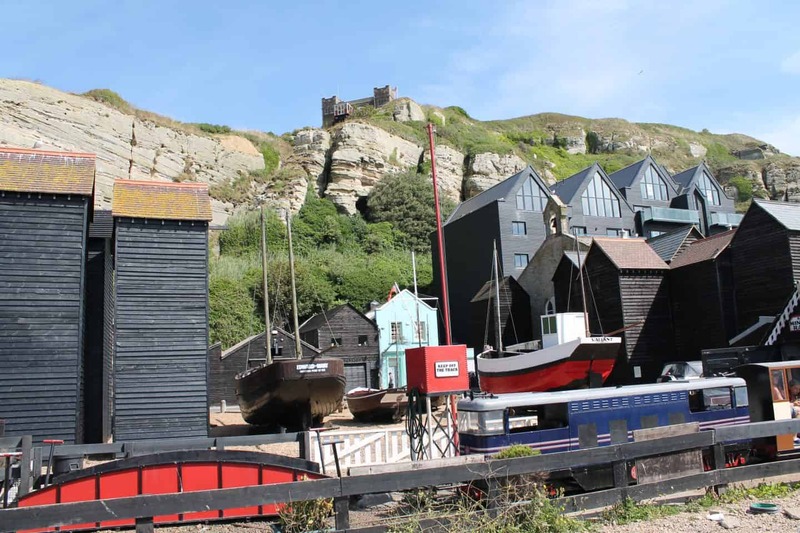 There was lots that we didn’t do in Hastings, like visit the Museum, the Adventure Park or the Castle but we’ll definitely come back again! There is also an iphone app available to help you plan your visit, although the website has an itinerary planner on it. In my mind I assumed Hastings was a fairly small town with not much to do other than the seafront, but upon further inspection it turns out I was wrong, and to do everything you’d probably need a couple of days to explore! Further afield you could visit Battle or Rye, and of course Camber with its glorious sandy beaches! 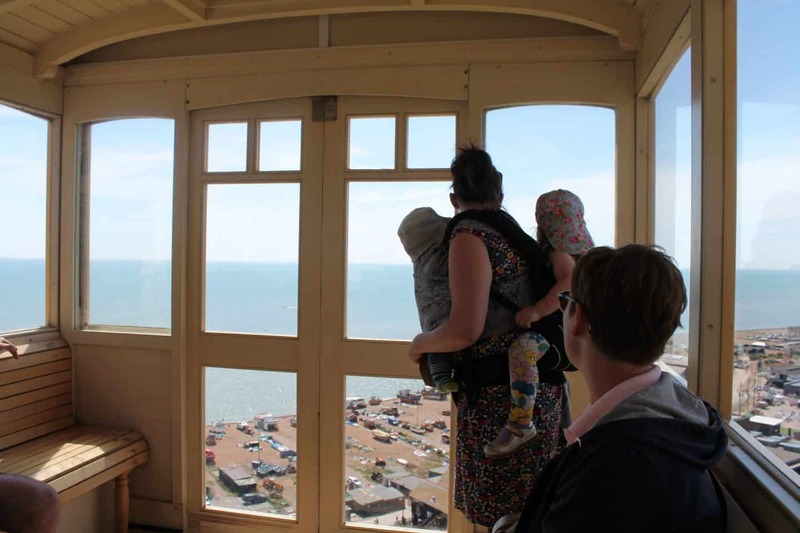 We were kindly invited to visit hastings by the ‘1066 Country’ tourist board and received free entry into the Blue Reef Aquarium & rode for free on the Funicular Railway. I’ve not been to Hastings for years and now I am intrigued to go back. I love finding out about things like the fisherman’s net huts, part of the coastal history. Food looks and sounds amazing.